Rogers & Brother was established in 1858. 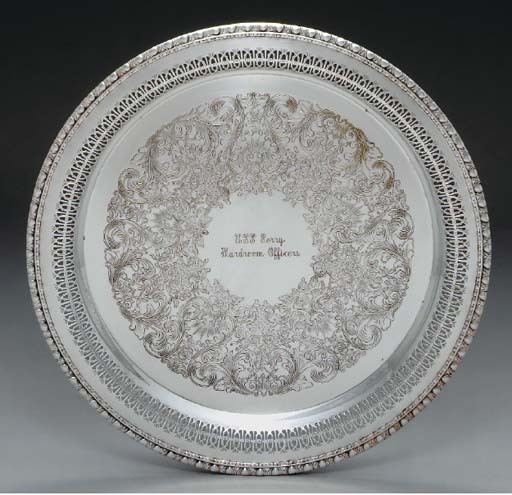 The company became part of the International Silver Company in 1898. Rogers & Brother. (c. 1850). Tablespoon. Plated nickel silver. (Accession no. HD 76.052. Viewed 6 July 2018. G02337). Rogers & Brother. (c. 1860). Tablespoon. Plated nickel silver. (Accession no. HD 2001.53.147. Viewed 6 July 2018. G02336). Presumably Rogers & Brother. (1860). Teaspoon. Silver or silver plate. (Accession no. 1975.97. Viewed 15 August 2018. L00501). Historic New England organization, Boston (1, 2, 3, 4, 5, 6). Rogers & Brother. (1865). Four dinner forks, Oval pattern. Silver or silver plate. (Accession nos. 2008.43.3.1-.4. Viewed 15 August 2018. L00500). Rogers & Brother. (1865-70). Four tablespoons, Olive pattern. (Object Id no. 1998.012.04-.07. Viewed 27 July 2018. H00027-30). Photos - New Hampshire Historical Society, Concord: tablespoon 1, 2, 3, 4. Rogers & Brother. (c. 1868). Eight forks. [Object ID nos. 1929.2.1.1(-.6), 1929.2.2, 1929.2.4. Viewed 12 August 2018. L00306-13]. Rogers & Brother. (1874-98). Butter knife, Olive pattern. (Accession no. 1980.236.72. Viewed 30 July 2018. H00089). Rogers & Brother. (1875-1900). Teaspoon. Silver or silver plate. (Accession no. 2008.49.165. Viewed 30 July 2018. H00080). Rogers & Brother. (1880). Serving spoon. Silver or silver plate. (Cat. no. P2002.11.026. Viewed 28 August 2018. J00200-01). Possibly Rogers & Brother. (c. 1880). Twelve table knives, six teaspoons, cake server, serving fork, serving spoon. Sterling silver. (Cat. nos. 1987.2.3; 1987.2.8a-f; 1987.2.16; 1987.2.22, 1987.2.29. Viewed 14 August 2018. L00396-97; L00400-07). Rogers & Brother. (1884-1900). Three teaspoons, Windsor pattern. Silver or silver plate. (Accession no. 2008.49.217-.219. Viewed 30 July 2018. H00098-100). Kansas Historical Society, Topeka: teaspoon 1, 2, 3. Rogers & Brother. (1884-1900). Dinner fork, Windsor pattern. Silver or silver plate. (Accession no. 2008.49.226. Viewed 30 July 2018. H00082). Click the following link to see the parallel webpage - Rogers & Brother design catalogues and historical information. Possibly Rogers & Brother. (c. 1890). Sugar tongs. Sterling silver. (Cat. no. 1987.2.41. Viewed 14 August 2018. L00408-09). Photo - Mattatuck Museum, Waterbury, CT (salad fork 1; 2; 3; 4; 5; 6). Rogers & Brother. (c. 1897). Six spoons, six forks, serving spoon, Assyrian pattern. Silver plate. (Object no. 1995.7.1-.13. Viewed 30 July 2018. H00101-07). Photos - Rutherford B. Hayes Presidential Library & Museums, Fremont, Ohio: spoon 1, 2, 3, 4, 5, 6; fork 1, 2, 3, 4, 5, 6; serving spoon. Rogers & Brother. (c. 1900). Six knives. Silver plate. (Cat nos. X71.93.2-.7. Viewed 22 July 2018. F00085-90). Mattatuck Museum, Waterbury, CT: knife 1; 2; 3; 4; 5; 6. Possibly Rogers & Brother / International Silver Company. (c. 1910). Twelve butter knives. Sterling silver. (Cat. no. 1987.2.4. Viewed 14 August 2018. L00398-99). Rogers & Brother. (undated). Six cocktail forks, Assyrian pattern. (Object nos. 2000.7.1447-.1452. Viewed 30 July 2018. H00115-20). Photos - Rutherford B. Hayes Presidential Library & Museums, Fremont, Ohio: fork 1, 2, 3, 4, 5, 6. Photos - Mattatuck Museum, Waterbury, CT (fork 1; 2; 3; 4; 5). Photos - Mattatuck Museum, Waterbury, CT (tablespoon 1; 2; 3; 4; 5; 6). Photos - Mattatuck Museum, Waterbury, CT (teaspoon 1; 2; 3; 4; 5). Rogers & Brother. (undated). Coffee and tea service: tray, coffeepot, teapot, sugar bowl. Silver or silver plate. [Cat. no. 2013.039.0001(-.0004A). Viewed 30 July 2018. H00090-95]. Photos - Aurora History Museum, Aurora, Colorado: tray, coffeepot, teapot, sugar bowl. Photo - Tennessee State Library, Nashville. Photos - Mattatuck Museum, Waterbury, CT (teaspoon 1; 2; 3; 4; 5; 6). Rogers & Brother. (undated). Six nutpicks. Silver plate. (Cat. no. 1997.186 A-F. Viewed 10 July 2018. G02479-81). Photos - Ashland, Henry Clay Estate, Lexington, KY.
Rogers & Brother. (undated). Dinner knife. (Cat. no. 1998.233 A-L. Viewed 10 July 2018. G02482-83). Photo - Ashland, Henry Clay Estate, Lexington, KY.
Rogers & Brother. (undated). Sugar spoon. Silver or silver plate. (Object ID no. L986.D.058.001. Viewed 19 July 2018. A03100; E00012). Rogers & Brother. (undated). Collapsible cup. Silver or silver plate. (Cat. no. 2012.031.0002.A. Viewed 19 July 2018. F00060). Rogers & Brother. (undated). Two dinner forks. (Cat. no. 2008.044.002-.003. Viewed 19 July 2018. F00056-59). Photos - Estes Park Museum, Estes Park, Colorado: fork 1; 2. Rogers & Brother. (undated). Spoon. Silver plate. (Cat. no. 2004.0145. Viewed 27 July 2018. H00045). Photo - Rosenbach Museum & Library, Philadelphia, PA. Probably Rogers & Brother. (undated). Six dinner knives, Olive pattern. Silver or silver plate. [Accession nos. 1971.1886.1(-.6). Viewed 13 August 2018. L00370-75]. Photos - Historic New England organization, Boston: dinner knife 1, 2, 3, 4, 5, 6. Presumably Rogers and Brother. (undated). Two teaspoons. [Object ID nos. H.6786.20.A(-.20.B). Viewed 13 August 2018. L00339-40]. Rogers & Brother / International Silver Co. (undated). Pickle fork, Empire pattern, for Missouri Pacific Railroad Company. Silver or silver plate. (Accession no. 2013.47.77. Viewed 30 July 2018. H00081). Rogers & Brother. (undated). Creamer. Silver or silver plate. (Cat. no. I 04082. Viewed 19 July 2018. A03099). State Historical Museum of Iowa, Des Moines. Photo - Christie’s New York - Maritime including scientific and engineering works of art (20 JUL 2005). 1 May - 30 October 1893. World’s Columbian Exposition, Chicago. For documentation online, see the Design Meriden - Rogers & Brother design catalogues and historical information page.